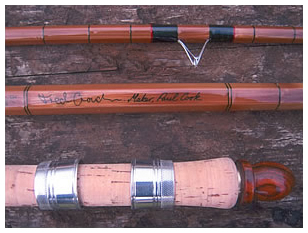 The modern split cane rod builder must achieve two things; good quality cane and a top quality finish. This is not an abject remark geared towards the makers of the past as there were many fine cane rods built many years ago by highly skilled artisans. Times have changed though, whereas the rod building industry from the past were building mass produced rods to feed a very demanding market, after all cane was the new material and demand was high. With the exception of some of the higher quality makers, the majority of cane rods were built to a price to suit the pocket and the quality of some of the finishing was poor but acceptable then. Today, the expectations are that much higher and the finishing is just as important as the build of the cane and the action of the rod itself. This requirement demanded from the prospective customer is both acceptable and understandable, cane rods are expensive to make and to buy. Our cane is well tempered to give a more steely feel and action to the rod and each blank is inspected and tested thoroughly. A well made blank, if treated with respect, should not take a set. All rods go through various stages of varnishing with the rod rings taking several coats of hand-brushed varnish before going into a dip tube for their final coat. All blanks are checked thoroughly throughout this process to check for impurities within the varnish finish and no rod will leave my workshop until I am happy with the finish. Each blank is hung to dry in a cabinet between coats to make sure that each finish is thoroughly cured before the next varnish coat is applied. Once the final coat of varnish has been applied it is left to dry in the heat cabinet for many weeks and thoroughly inspected before being despatched. All my cork handles are built using the finest quality cork available and finished to a silky smooth finish. Handle shapes vary and the customer has a choice of either onion, doughnut or flared trumpet. High quality polished aluminium slide bands and end caps are used although I can offer these in an alternative nickel silver. End caps are finished off with a black rubber button. Best quality ferrules are used throughout and are usually made from brass and are reinforced where required. I can also offer ferrules in nickel silver and although more expensive than brass, prove to be far more superior. All ferrules are blacked and then lacquered for protection and come with a wood stopper. There are some excellent silks and nylons available today with a variety of colours to suit the taste of the modern traditional angler. On coarse rods I use a grade A on the rod rings only. I only use a very fine grade silk for the intermediates and have found the finer range of silks to be excellent and although very thin, they do hold up very well to high tension when tying off the intermediate whips. The beauty of using finer thread on the intermediates is that it reduces the “ridging” created by using heavier grade silk for this type of work along the blank. As mentioned in the restoration section, good quality traditional lined rings are becoming increasingly more difficult to find. I do carry a good stock of traditional rings to suit cane rods in a variety of colours from various shades of red to the old amberfin style rings. Intermediate rings are good quality hard chrome and maintain a traditional look not so far removed from the original rings used on the original cane rods from the past. Rods can be supplied with Nickel Silver fittings rather than the standard alloy fittings. Nickel Silver ferrules are available for the MK IV Carp and MKIV Avon only. Slide bands, End caps and Winding checks all made from Nickel Silver are available for all the rods in the range. Silk Whippings. All the rods I make come with standard 1" intermediates and graduate closer towards the tip, finishing at 1/2" spacing's. Rods can be finished in closer tie intermediates with 1/4" spacing's as the original MKIV rods from the B. James stable. Rods can be also be built and finished with no intermediate whippings.